Straight up too much time is spent punching a wide array of passwords for various apps onto the tiny text fields of our phones. Google’s trying to fix that with the Identity Platform, new tools for developers to help keep users signed into their apps in a secure, hassle-free way. 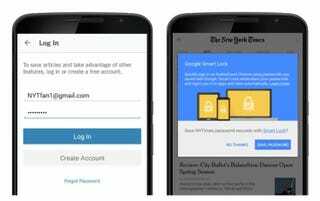 Google already has a password manager called Smart Lock that autofills known passwords on Chrome pages and native Android apps. Now Smart Lock for Passwords will expand that to third party apps when it’s released as an API for third-party developers. Look for it first on apps from Eventbrite, Orbitz, Netflix, Instacart, the New York Times, and eventually LinkedIn. When you sign in to apps or sites the first time, a prompt will ask if you want to save the password to Smart Lock. When you say yes, you won’t have to go through the password-entering process again across all your devices, whether you’re on an app on your phone or using Chrome on your laptop. While this is extremely useful for anywhere you need to enter a password to access your stuff, I can see it being most useful for something like the New York Times because I access their content in so many different ways throughout the day. I might find a story on their app, by following a link in Twitter, or by doing a Google search. It would be so nice not to have to worry about getting logged out between apps or devices. In addition to the Smart Lock for Passwords, you’ll also start seeing the “Sign in with Google” button for some third-party apps much like you already see in Gmail, Google Play, and Google+, and other Google services. And finally, Google’s giving developers an Identity Toolkit, an “authentication in-a-box” which will help them create a more secure password and sign-in system for their apps. Later this year, Google plans to release a Smart Lock for Passwords API for other platforms as well. While most of us probably already have our passwords saved in Chrome, for example, this adds many more potentially sensitive passwords to the mix, and could mean that anyone who steals your phone could easily start messing with your online life. All the more reason to keep your phone secured in the event that it gets into the wrong hands.